An estimated total of 2,000+ people attended three Speak Life! rallies in Portland, Salem, and Medford to celebrate the sanctity of human life and give voice to a shared mission of protecting women and babies from abortion. The event series was held on January 21 and 22, with Oregon Life United as the presenting organization. Additionally, nearly fifty pro-life groups, media organizations, businesses, and generous individuals contributed as supporting sponsors to help make the rallies a success. 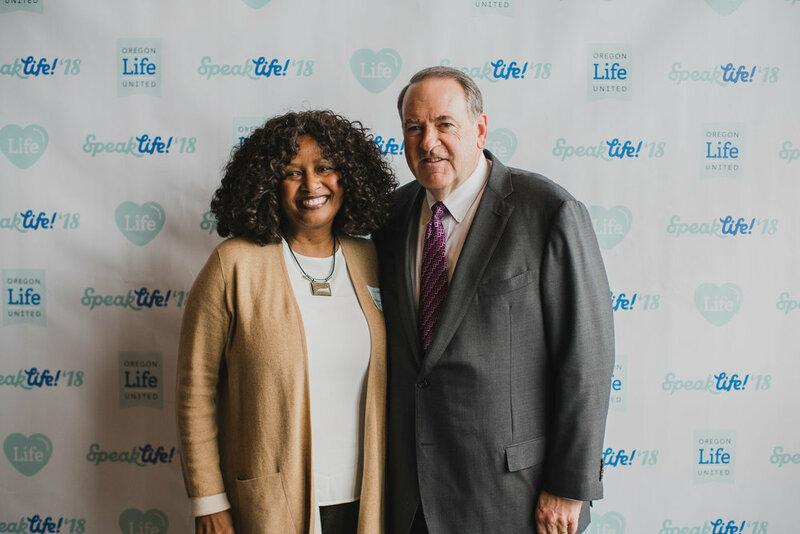 Mike Huckabee, former Governor of Arkansas from 1997–2006 and U.S. Presidential candidate in 2008 and 2016, was the keynote speaker for all three events. 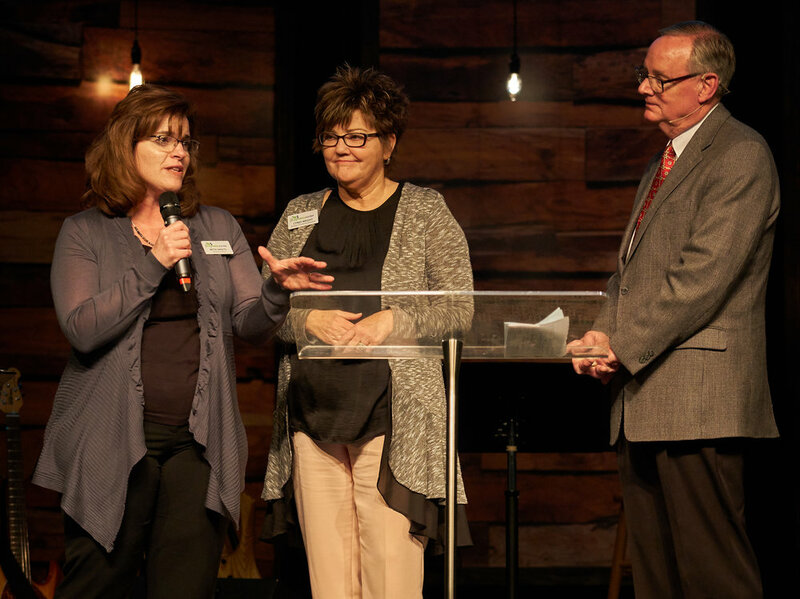 He was joined on stage by representatives from four different pro-life pregnancy resource centers, and powerful personal testimony was shared about finding healing after abortion. Oregon State Rep. Greg Barreto, Rep. Sherrie Sprenger, and Rep. Duane Stark also spoke about the horrific HB 3391 and the fact that Oregon is the only state in the country without any limits or restrictions on abortion. 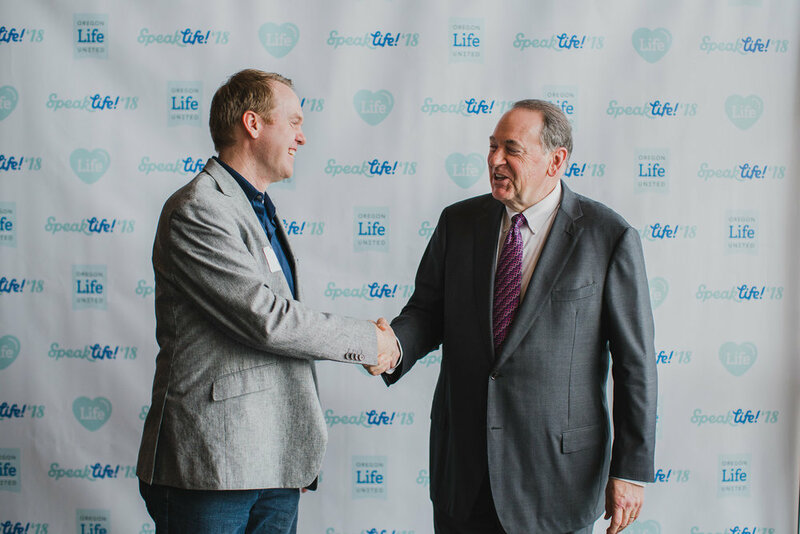 Jeff Jimerson, director of Oregon Life United, shared a vision for how we can protect thousands of lives by signing and circulating Petition #1 to stop taxpayer-funded abortion in 2018. Oregonians in all corners of the state are encouraged to get involved by requesting petitions at www.StopTheFunding.org. The next Speak Life! events will be held on May 20th in Corvallis and May 21st in Bend featuring late-term abortion survivor Gianna Jessen. Get more details and free admission tickets at www.OregonLifeUnited.org/speaklife. It was announced today that HB 3391 — known as the “free abortions for all” bill — has been signed into law by Governor Kate Brown. The partisan legislation, which was passed last month by the Oregon House and Senate, requires private insurers to cover abortion without a copay and significantly increases the number of state-funded abortions. By declaring the law to be an emergency, Gov. Brown and sponsoring legislators have stripped Oregon citizens of their right to refer HB 3391 to the people for a vote. The law goes into effect immediately. The devastating legislation is opposed in the strongest of terms by a broad spectrum of pro-life and faith-based organizations, as well as fiscally conservative political organizations and legislators. HB 3391 imposes an undue burden on Oregon taxpayers, and will cause thousands of women and babies to be hurt by abortion. We urgently call on Oregon voters to express their opposition to HB 3391 by signing the Stop Taxpayer Funding for Abortion Act — a citizen initiative sponsored by Oregon Life United. More than 117,000 signatures are needed to qualify the measure for Oregon’s November, 2018 ballot. Voters may print and sign Initiative Petition 1 (IP-1) at www.StopTheFunding.org. Oregon House Bill 3391, which provides “free abortions for all,” is now the law of the land. The far-reaching legislation is receiving national press coverage for significantly expanding taxpayer-funded abortion in the state. Here’s what you need to know, and how Oregon’s pro-life community can push back. First, HB 3391 requires all private health insurers to offer free abortions without restrictions or copays. The one exception is Providence Health Plans, which had threatened to pull out of the state because of the abortion requirement. Instead, individuals covered by Providence will soon be able to obtain free, taxpayer-funded abortions through the Oregon Health Plan. Second, it gives $10.2 million to expand the Oregon Health Authority in order to provide “services, drugs, devices, products and procedures” for undocumented residents, $500,000 of which would specifically be used for abortions. Additionally, beyond expanding taxpayer-funded abortion, the law goes further by specifically barring public employees from inhibiting or restricting access to abortion in any way. In short, it’s one of the most aggressive pro-abortion laws ever passed in the history of our country. Planned Parenthood, along with a coalition of other pro-abortion organizations, took credit for the bill in a press release issued on Wednesday. “The Pro-Choice Coalition of Oregon … developed the legislation over the past two years with input from community leaders and legislators,” it said. The chief sponsors of HB 3391 are House Majority Leader Jennifer Williamson (Portland), Representatives Julie Fahey (Eugene) and Jeff Barker (Aloha), and Senators Richard Devlin (Tualatin) and Laurie Monnes Anderson (Gresham). The bill passed the Oregon House by a vote of 33-23 on July 1, and on Wednesday the state Senate voted 17-13 to send it to Governor Kate Brown’s desk for final approval. Every legislator who voted in favor of HB 3391 is a Democrat. The big winner here is clearly Planned Parenthood. According to the Oregon Health Authority, $23.8 million was paid to Planned Parenthood and other clinics for abortions covered by the Oregon Health Plan over the past 14 fiscal years. This new law dramatically increases the amount of taxpayer money funneled into the abortion industry. Pregnant women and their babies will be hurt the most by this legislation. It’s long been known that Oregon is the only U.S. state without any laws to protect society’s most vulnerable members from abortion. Now our state’s ruling party has gone even further by codifying into law a mother’s ability to kill her own offspring, at taxpayer expense no less. With this latest expansion of abortion funding, Oregonians who don’t want their tax dollars used for the destruction of human life are also losing big with this bill. HB 3391 increases the moral and financial burden on Oregon taxpayers who are already being forced to pay for 10 abortions each day under the Oregon Health Plan (OHP). Lastly, the rights of Oregon voters are being attacked by this legislation as well. By declaring the law an emergency, lawmakers have stripped citizens of their right to challenge the law by voter referendum. This is truly an act of tyranny. It’s hard not to be discouraged by a law that is so devastating on so many levels. It hurts pregnant women and babies. It violates the conscious of taxpayers. And it handcuffs voters from exercising their rights. Despite all of this, there are some positive ways the pro-life community can and should respond. To begin, we can all take a moment right now to pray for an awakening in the Church. Many Christians, including pastors, are slowly becoming aware to the plight of the unborn. Pray that this ungodly law would stir more of God’s people into action. Next, we can make a commitment today to support the Stop Taxpayer Funding for Abortion Act. 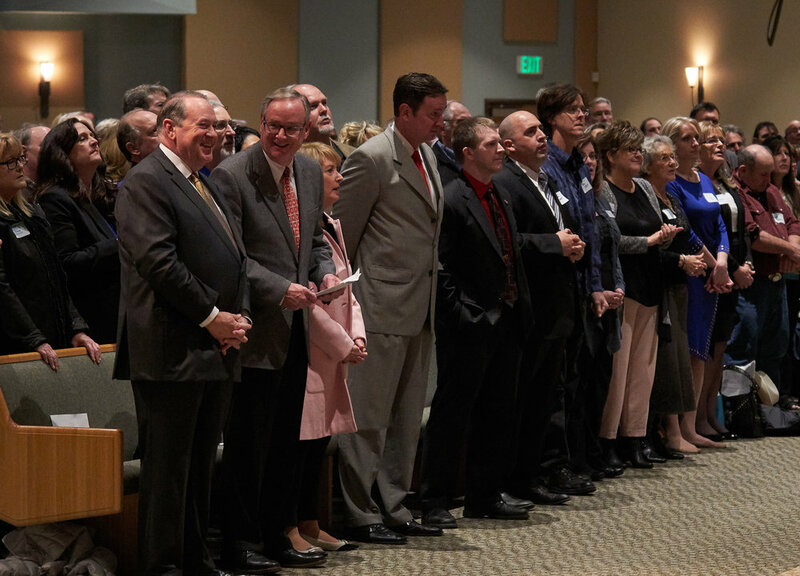 This grassroots citizen’s initiative, led by Oregon Life United, will block the stream of taxpayer dollars now funding approximately 3,700 abortions annually through OHP. This initiative will also reverse the expansion of taxpayer-funded abortion mandated by HB 3391. 117,000 valid signatures are needed to qualify our pro-life measure for the next statewide ballot. Hundreds of individuals have recently requested petitions from our website, StopTheFunding.org, and an estimated 75,000 signatures (as of September 12) have been mailed back so far. While this is a great start, we have work to do! The two biggest ways you can help are by gathering signatures and making a financial contribution. Many people are finding great success circulating the petition at their churches. If your church hasn’t yet held a petition drive this summer, talk with your pastor right away about why this is ballot initiative is so important. As to financial needs, because of our many committed volunteers we’re able to accomplish a lot with a relatively small budget. Still, approximately $5,000 per month is needed to facilitate this statewide petition drive. Babies are dying in Oregon today because of taxpayer-funded abortion. It’s hard to predict how many more lives will be lost if this new law is not reversed. Please follow the links below to take action now. » Sign the petition to stop our tax dollars from funding abortions. » Request petition sheets and help us gather the 117,578 signatures needed. » Make a financial contribution to help us cover our expenses.